To celebrate World Puppetry Day and Titeretada 2018, we premiere our documentary series in Puerto Rico, Puppetry in the Latin Caribbean (Episode 3: Puerto Rico). 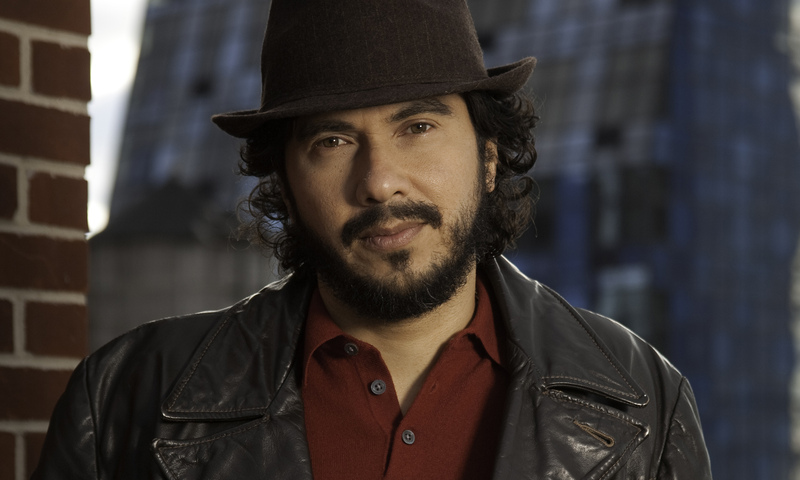 This episode marks the third and final in the documentary mini-series directed by Manuel Moran and Kristian Otero-Moran. This 70 minute episode provides viewers with an understanding of the origins of puppet theater in Puerto Rico and presented a unique view of work of many of the pioneers and notable figures in the world of Puerto Rican puppetry. To commemorate World Puppetry Day on Wednesday March 21 we will host a presentation of the third installment of our Puppetry in the Latin Caribbeanmini-doc series. The viewing will take place in Fine Arts in Hato Rey at 8pm. Simultaneously, Teatro SEA in Manhattan’s Lower East Side will also be hosting a viewing of the episode to coincide with the global puppetry celebration. 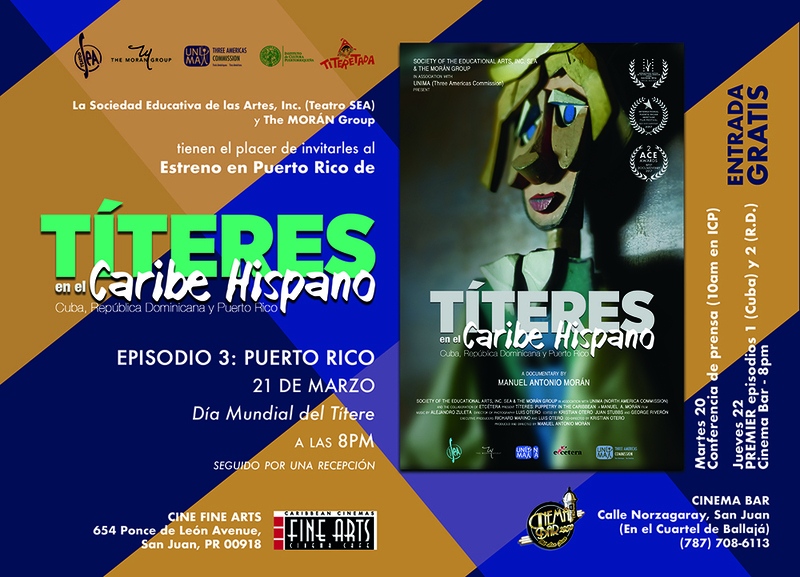 On Thursday march 22, we will host the Puerto Rican debut of episodes 1 & 2 of the mini-doc series, Puppetry in the Latin Caribbean. The episodes will be shown at Cinema Bar in Old San Juan at 8pm. Episode 1 spotlights Cuba, whereas episode 2 focuses on Dominican Republic. The art of professional puppet theaters in Cuba was trailblazed by student Modesto Centeno with his version for an altarpiece about the story of Perrault, Little Red Riding Hood, and more before and after the Cuban Revolution with brother Carucha and Pepe Camejo. The Camejo brothers are the indisputable pioneers of the art of puppetry in Cuba. Their work culminated in the creation of Teatro Nacional de Guinol (National Puppet Theatre), but was interrupted when they were placed in mandatory exile. Nevertheless, thanks to their their hard work their vision manifested in an incredible way to create of of the most prolific puppetry movements in the Greater Antilles; quite possibly in the world. In the 1950s, Jaime Colson founded a puppetry company, where the now defunct Dominican newspaper La Nacion said it was the first puppetry company in the Dominican Republic. The company was mostly comprised of painters and students studying painting, one of which was Silvano Lora. Then a group called Pinpirigallo, comprised of Romilo Rivas and Mercedes Diaz, created a puppetry spectacle as part of a government adult literacy program. The educational program traveled throughout many regions of the Dominican Republic. Then, Anahilda Garcia began in 1977. In Puerto Rico the development of puppet theatre occured thanks to a series of government institutions that took it upon themselves to establish the tradition of theater on the island: The Puerto Rican Cultural Institute, the University of Puerto Rico, and the Department of Education of Puerto Rico. With the incredible guidance of Dr. Leopoldo Santiago Lavandero and his Rural Mini-Theatre for Children, he paved the way for puppet theatres in Puerto Rico. 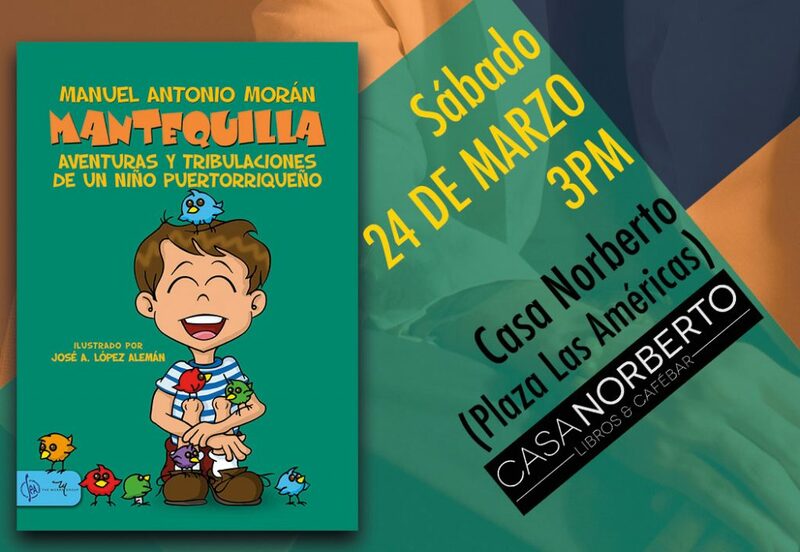 The MORAN Group and the Society of the Educational Arts, Inc. (SEA) invites you to the presentation of the book “Mantequilla/Butter” by Dr. Manuel Antonio Moran and illustrated by artist Jose A. Lopez Aleman. 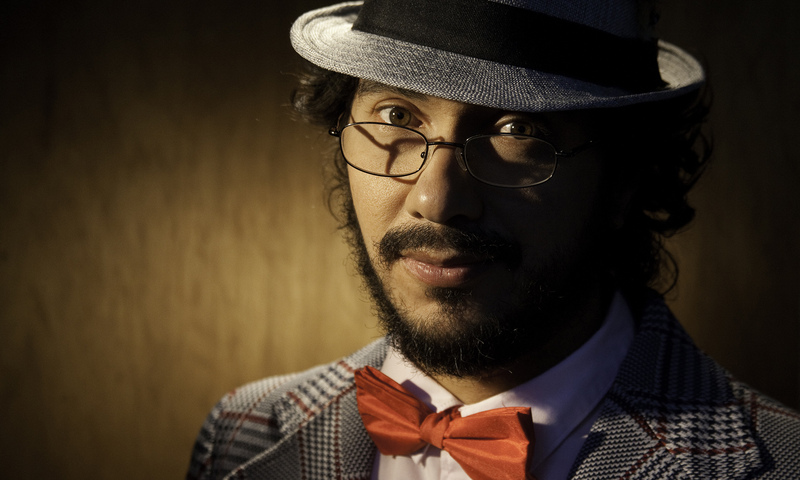 Moran presents his second book, a compilation of vignettes about the childhood of a boy growing up in Puerto Rico. 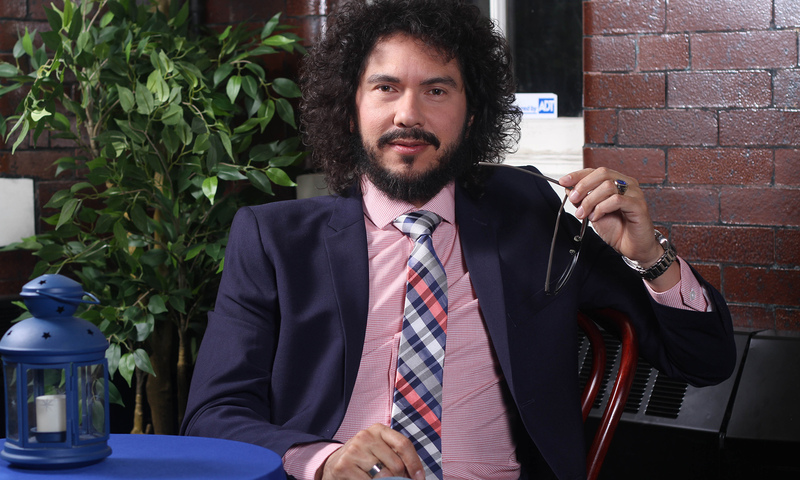 The event will be hosted by Elsa Mosquera Sterenberg, the book’s editor and the Victor Rivera Hernandez, Esq. There will be a dramatic reading of an excerpt from the book. The event will continue with a reception and signing of the book from the author and illustrator. “Mantequilla/Butter” is published by Publicaciones/Editorial SEA which after 32 years intends to expand their theatrical work with the purpose of encouraging the reading of theatrical works as a genre – a bilingual one at that. It also aims to provide a tool of support to the teacher and enrich the learning experience of the student. 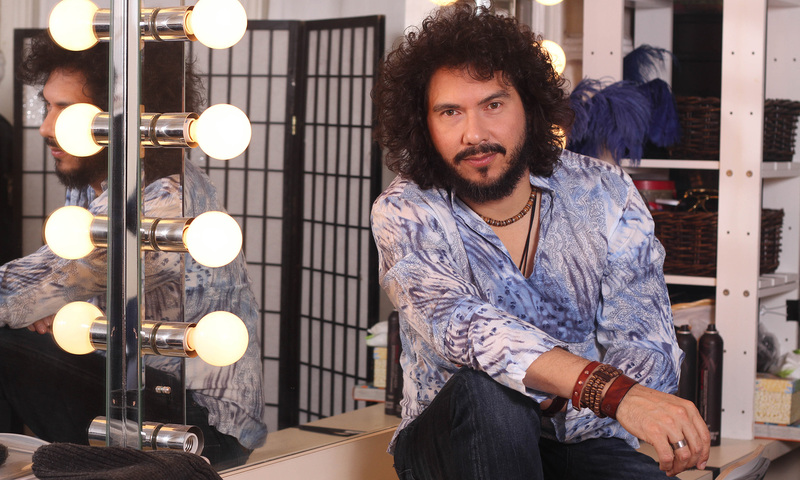 Teatro SEA was founded by Puerto Rican artist, Dr .Manuel Antonio Moran. It continues to be on of the most important Latin theaters in the United States. Their productions are mostly geared towards young audiences. SEA is a bilingual organization of Arts in Education whose main objective is aid in the personal progress of children and young adults through the use of arts in the field of education. 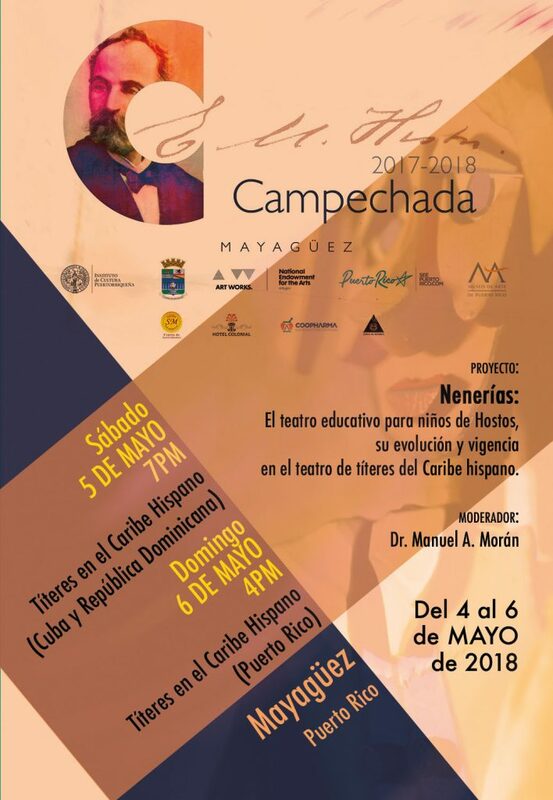 As part of Campechada 2018, which takes places in the city of Mayaguez during the month of May, there will be a showing of the documentary series Puppets in the Latin Caribbean. 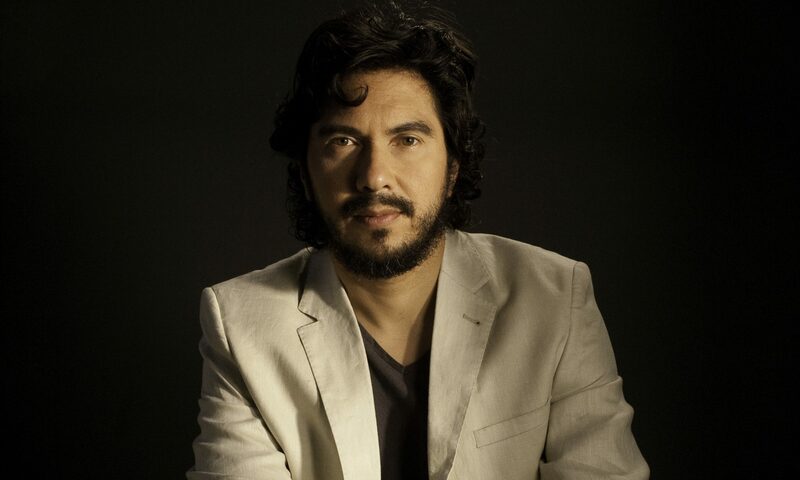 The series consists of three episodes (Episode 1: Cuba – 45 minutes; Episode 2: Dominican Republic – 45 minutes; Episode 3: Puerto Rico – 70 minutes ). 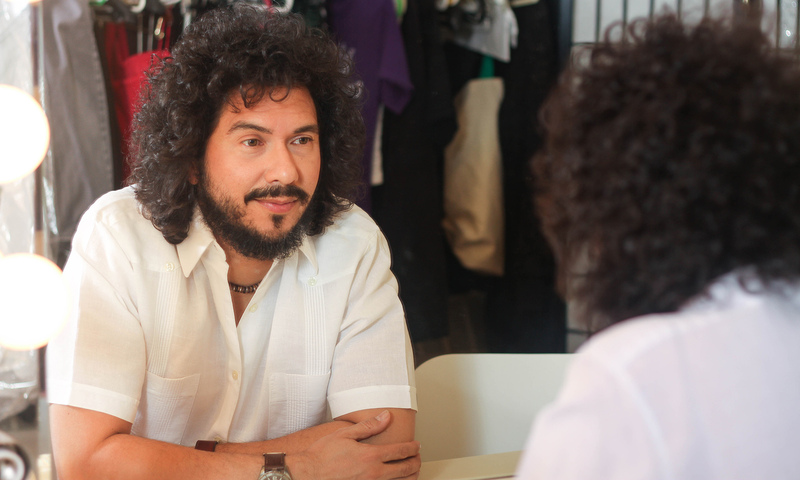 Prior to each presentation, there will be an introduction by Dr. Manuel Moran along with interviews with some of puppeteers. On the second day, prior to the presentation for Episode 3: Puerto Rico, we will have an introduction and interview. At the end of the viewing, there will be a panel discussing the development and the evolution of the puppet theater in Puerto Rico and the Caribbean from the educational and social point of view of Hostos. This program hopes to convey to the public the importance of the children’s theater of Hostos, their vision, their pedagogical strategies, and how their strategies were adopted in children theaters throughout Puerto RIco and the Latin caribbean at large.